Since our launch in 1975, we at Bear Family have wanted to honor Chuck Berry. There have been endless Chuck Berry compilationsâА”more than anyone could possibly tabulate, but we wanted to do the ultimate Chuck Berry compilation In other words, everything you want by Chuck Berry in one place! The last word on the first name in Rock âАШnâАЩ Roll. 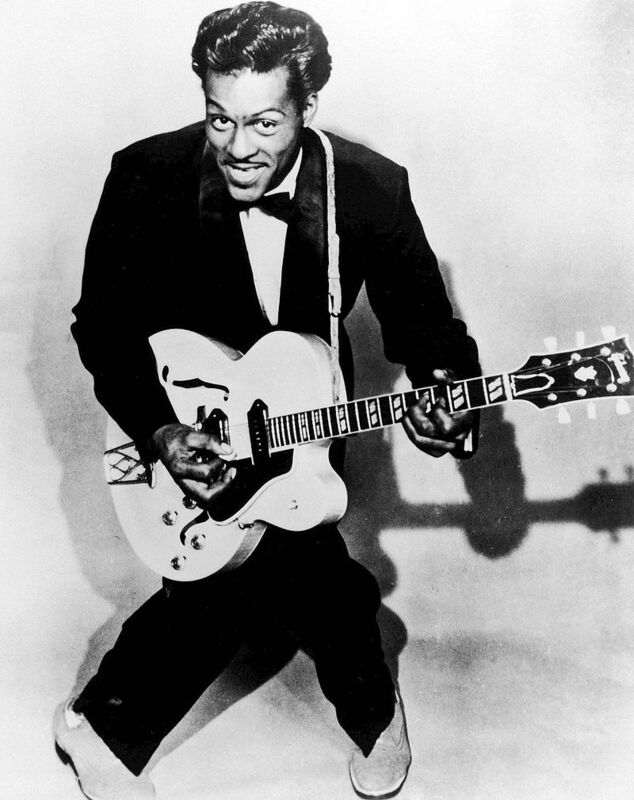 Chuck Berry was one of the key figures in the rock ‘n’ roll explosion of the mid-’50s, as musical styles that had been part of R&B and country for a number of years came together in a cross-cultural hothouse fuelled by the power of mass media and the rebellious attitudes of the baby boom generation. From the rockabilly flavoured Maybellene to the adrenalin rush of Dear Dad (both about automobiles!) this formidable collection spans ten years and over 20 Hot Hundred Hits. They’re all here. All his greatest songs. This is a non-stop hymn to the USA; a crash course chronicle of high school hops, teen romance and rock ‘n’ roll cartography. Hear the most imitated electric guitar licks of all time! Every track released between 1954 and 1960, plus bonus selections. 70 cuts in all. He was 29 and had a string of criminal convictions before he made his first record, but the man christened Charles Edward Anderson Berry must have been pre-destined to become the best songwriter of the Rock n’Roll era, how else could such an unlikely candidate achieve so much’ Chuck’s finest work came between 1955 when he signed a deal with Chess Records and his 1961 incarceration. This 3CD set features every track Chuck made or played on during this era. The set includes deluxe ‘oyster-box’ packaging and 20 page booklet with extensive notes by R’n’B and Jazz expert Charles Waring. Chuck Berry has been an institution now for almost 50 years, perhaps one of the most influential songwriters and performers of the 20th Century. Without his many songs to perform and to inspire them there may never have been a Beatles or a Rolling Stone. He continues to tour and perform around the world and this collection features a typical Chuck Berry live show. Direct metal mastering. Limited edition classic LPs. Audiohile pressing with bonus tracks. This quintessential reissue includes Chuck Berry’s magnificent debut album, After School Session, originally released in May 1957 by Chess Records. In addition to the original masterpiece, this collector’s edition also contains 4 bonus tracks from the same period, including “Rock & Roll Music,” “Thirty Days (To Come Back Home),” the unforgettable “Sweet Little Sixteen,” and “Maybellene”. The two classic cuts that bookend this album should be enough to attract the uninitiated, but Rockin’ at the Hops not only has no filler, but it’s chock full of records that show off a bluesy side of Berry’s output that was never fully appreciated at the time. Originally released on Chess (LP 1456) in March of 1961, this record is digitally remastered from original Chess masters. Most rock & roll albums recorded in the ’50s were notorious for being nothing more than a few hit singles patched together with hastily recorded versions of pop standards. Though Chuck Berry recorded his fair share of run-of-the-mill pop standards, he was one of the few rock artists who managed to make consistently good albums during his ’50s heyday. Like most albums of the day, NEW JUKE BOX HITS was based around two hit singles, “Sweet Little Sixteen” and I’m Talking About You.” The rest of this album is made up of obscure (though wonderful) Berry-written tracks. Chuck Berry’s second solo album, following 1957’s After School Session, One Dozen Berrys, was generally considered to be a much more sophisticated outing than its predecessor. There were four instrumentals among the twelve tracks on display, along with a couple of ballads and songs that owed inspiration from styles and genres ranging from the blues to country. All of which proved it was dangerous to put Chuck Berry into any one category; his success would transcend most styles of the time.